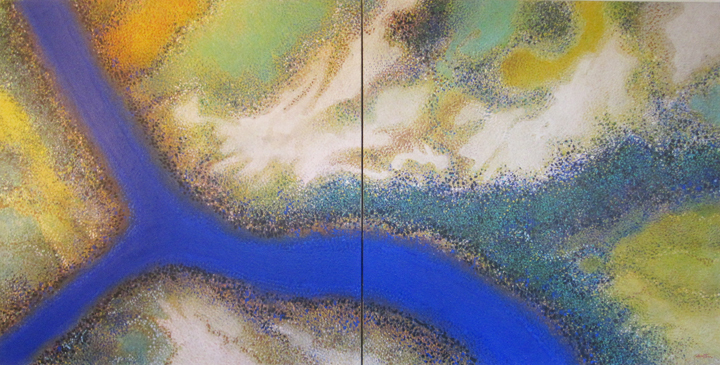 curvature, desert, outback, portraits, rock pool and reef paintings: for sale, rent or lease. Graham Austin welcomes you to browse his original paintings, contemporary online art gallery. acrylics, oils and watercolour. It is hoped you will enjoy your visit. he also indulges himself with oil painting. Australian landscape, the great outback is generally his preferred subject matter. portraits, rock pool and reef paintings: for sale, rent or lease. spotted [pointillist] patterns when observed close up. When viewed from a distance there is a visual fusion into recognisable veracity of subject matter. His paintings may give the viewer a sense of flight, perhaps even an exciting or tormenting hint of any fear of height. Most paintings are for sale and enquiries from galleries are particularly encouraged. Likewise he encourages you to indulge yourself by browsing his acrylics, oils and watercolour paintings. Your comments, constructive or otherwise are also welcome. on the Australian landscape, great outback and ocean reef. the fact that they look different when they are viewed from different angles. but when viewed from a distance they transform into a recognizable subject matter. The sense of excitement that is present in Graham Austin’s work is intoxicating. From one shade to next, the colours seem to blend together seamlessly without borders". action against natural human tendencies. Left to natural devices, human energy and endeavor moves towards entropy and disintegration. Our lives lead inevitably to decay and death. requiring a supreme effort to arise and join the world. The end of a gesture, when not treated with an artistic attack of acceleration, tends to die out. rises above the tendency towards death and negation. The artist searches for lightness and for exactitude in the face of rot and decay. Fueled by curiosity, energy and hope, we enter the darkness. We accept the darkness and in that acceptance sometimes we discover a thin vein of light". - Anne Bogart, American director of theatre. located in Chelsea, New York art galleries district. and publisher of ARTisSpectrum magazine. welcome to submit their portfolios for review.